Study: Caffeine Can Increase Miscarriage Risk Limiting caffeine during pregnancy is standard advice. But a new study sheds light on how much may be too much. More than 200 milligrams of caffeine a day can double a woman's chance of miscarriage, according to the study. New research shows that consuming more than 200 mg of caffeine a day can double a pregnant woman's chances of miscarriage. Below, some common servings of drinks and food, and how many milligrams of caffeine they contain. Limiting caffeine during pregnancy is standard advice. But a new study, published in the current issue of the American Journal of Obstetrics and Gynecology, sheds light on how much may be too much. The study, led by Kaiser Permanente reproductive and perinatal epidemiologist De-Kun Li, included about 1,000 women from the San Francisco Bay region. What's unique is that researchers had the women write down how much coffee, tea and caffeinated sodas they were drinking, starting in the earliest weeks of their pregnancy. Most of the women were in their late 20s to mid-30s. "They were recruited very early in pregnancy from a pregnancy test," explains Tracy Flanagan, director of Women's Health at Kaiser Permanente's Northern California region. So the researchers had really complete miscarriage data. Women who consumed 200 milligrams or more of caffeine per day had twice the miscarriage risk as women who consumed no caffeine, the study concluded. "What's really interesting about the study," says Flanagan, "is that so many causes of miscarriage are not alterable by lifestyle or anything a woman can do. So, cutting out caffeine can be a pretty easy thing to do for the first three or four months of pregnancy, when the miscarriage rate is the highest." Many studies have found a link between high caffeine intake and miscarriages. But this study evaluated the risk of just 200 milligrams or more of caffeine a day. Looking at the findings, Flanagan says it can be tricky to translate them into easy advice for women. If you stick to the idea of limiting consumption to just one caffeinated drink a day, it doesn't take into account all the variation in caffeine concentration and serving sizes, too. Take for instance, a standard cup of auto-drip coffee. An 8-ounce mug will have roughly 140 milligrams of caffeine. "But most people don't actually measure out a measuring cup of coffee," says Flanagan. "And how it's brewed makes a difference, too." There's variation in the caffeine concentration of beans as well. If your morning starts with a stop at Starbucks, one tall coffee has roughly 240 milligrams of caffeine. For women who want to taper down their caffeine intake, green tea is one option. It typically has about 25 milligrams per cup. Regular tea has a little more, with 45 to 50 milligrams per 8 ounces. Most caffeinated colas or soft drinks have about 35 milligrams in a 12-ounce can. Drinking one of these a day is a way to limit caffeine. 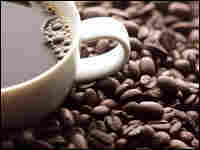 The other option, for pregnant women, or for those trying to become pregnant, is just to give up caffeine, cold turkey. Tammy Plotkin-Oren, a 35-year-old financial-planner from San Francisco, says she definitely missed the morning rush when she gave up coffee. But she says switching to herbal tea was the obvious choice for her. She explains her first pregnancy ended in a miscarriage. "I remember asking a lot of questions, 'Is it something that I did? What can I do differently so that it won't happen again?'" she says. She had already cut out alcohol, and wasn't a smoker, so eliminating caffeine was the change she could make. "I made the decision that I was going to do anything that I had control over. So it was very black and white. It was like — no more caffeine, done," says Plotkin-Oren. Three healthy children later, she says giving up caffeine clearly wasn't much of a sacrifice.